VH 3 Schellingwoude Cup in 1978: 1st. Baron Cecar van Rensloo was a calm, uncomplicated dog with much hardness. He passed his VH 3 before 23 months of age, followed by his IPO 3, SchH 3, RCI 3, FH and VZH. He passed the ZTP with 1A rating for character and V for conformation. His sire, Alva vom Franckenhorst, passed the German Erstkörung at 2 years of age with 1A rating while her maternal grand-dam, Gravin Grazie, passed the Swedish Körung. Cecar was dual champion in both working and conformation and was put to sleep at 13 years of age due to suffering from cancer. 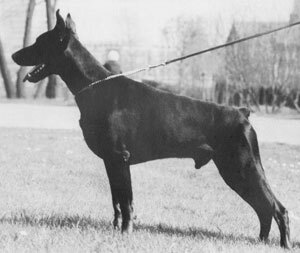 Cecar's sister from an earlier breeding, Bonita van Rensloo, passed the German Erstkörung at 2 years of age with 1A rating and was the foundation female for the van Hermansjomaik Kennel while his sister from a later breeding, Eva van Rensloo, was the foundation female for the van de Groote Maat Kennel. Baron Bryan: SchH 3, FH and passed the ZTP with 1A rating for character and V for conformation plus winner of numerous show titles. He is sire of the van het Wantij “O” litter (Odin) and vom Norden Stamm “O” litter (Ondra).